It's clear to me now that the fastest way to use stash is to prepare backings for already-pieced quilts and get those babies quilted. 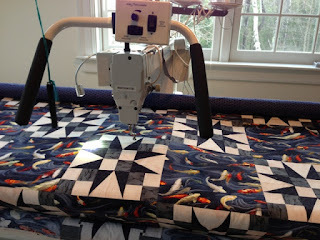 Quilting has been a bit of a challenge since I've been holding myself to unattainable, (for me,) standards. Today, I put the Tulane Picture Frames quilt onto the frame and made the backing. I quilted it up lickedy split with free motion spirals, which came out even bettern than I'd hoped. I was inspired by Denyse Schmidt's quilting book that shows a lot of great modern quilts with really simple or monotonous quilting. It really is ok for the fabrics and the piecing to be the stars of the show. Since this is a casual, "throw it in the car for impromptu picnics," quilt, it is perfectly adequate. Despite the holiday, I was able to steal upstairs to work on a few projects. This is a computer case for Lizzie, Alexandra's friend. 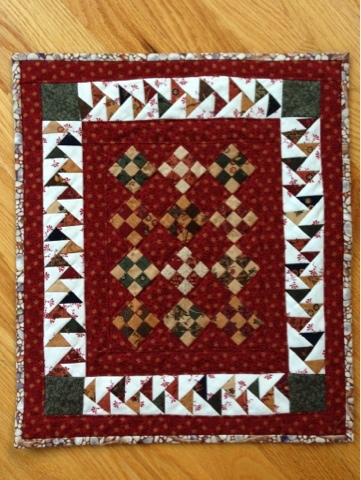 I also finished this mini quilt, Little Red Goose Migration. It's been awaiting quilting for almost a year. Another quilt, Stars and Fish, finally got put on the frame with a backing, and is now quilted. Binding is attached but not hand stitched. Even though I'm working today, I've succumbed to some cybersales. 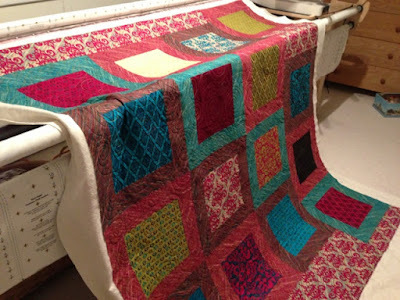 I have wanted to make this quilt, and the kit was reasonably priced to begin with, but I wanted to use stash. I figured out the pattern, but then the kit went on sale for 60% off, and wouldn't it be a waste of time not to buy it? Yet I won't then be using stash to make it. Too bad. connectingthreads.com is a weakness of mine. I know, I know. This stash blog isn't curbing my temptations much, but at least it's keeping me honest. 18.25 yards for $52. That's $2.85/yard and 2 patterns to boot. But they were having such an awesome sale!! Lots of Dear Stella, and a few other Kona prints I could not resist...18 yards for $95. That averages a little more than $5 per yard. I'll try to consume faster!! Perhaps backing a few quilts and quilting them will get me out of this hole I've dug. 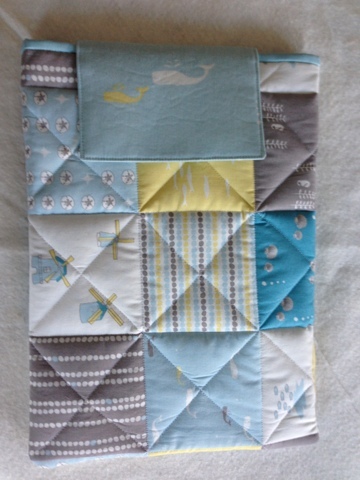 I've made a few little squares using FQs and scraps, amounting to very little consumption. Also, I finished that Scrappy Star top. Photo to follow...soon. 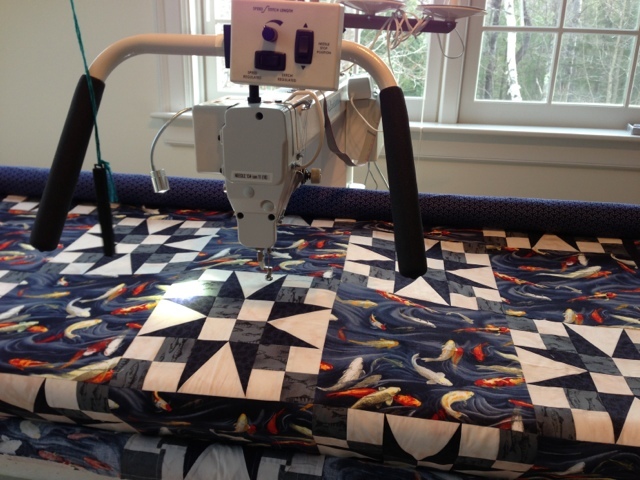 I had a terrific time in a little quilt class at the show in Manchester, formerly held in Nashua, NH called A Quilter's Gathering. 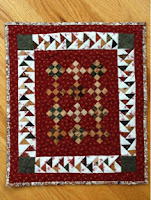 It was taught by Pat Harrison, who has her own method of piecing these blocks. I am going to count the fabric scraps that I used as stash busted, since there was also a lot of yardage that I had to tap to get it scrappy enough. 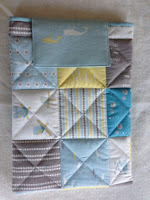 I may not be an enormous fan of the scrappy quilt. I like other people's more than mine, which tend to just look like garbage. Others in the class had fabrics that read more like solids. As I am learning, that is not what I tend to be putting in my stash...good information to know. These are mine. A little busy, but Pat says to just keep adding more scraps to scrappy. I must try to have faith. These are some made by classmates. My favorite are Jane's which read as solids, in the middle. Alison, a perfectionist, planned every batik (right) and ended up with much more intentional blocks. She judges quilts, organizes shows and retreats, and was an information analyst for the NSA at one time. Cool. For stash count, I'm going to count the approximate yardage for top and borders. Much came from the scrap bin, but that should count, no? I also bought some fabric from Lola Pink. They've got a few PUL fabrics, meant for diaper making, that I'm going to experiment with for lunchboxes and maybe pencil cases. I love new textiles! I love old textiles, too. Stash used: 5 yards when taking into account the piano key border. That thing is a lot of work.